Subway Squawkers - A Yankees-Mets Rivalry Blog: John Sterling is closing in on his 5000th Yankee broadcast. Are you excited? John Sterling is closing in on his 5000th Yankee broadcast. Are you excited? It's official. 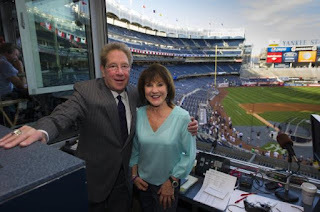 John Sterling and Suzyn Waldman will be back in the Yankees' broadcast booth this year and the next, something that was talked about a few weeks ago. WFAN recently announced the news with some hyperbolic comments that made my eyes roll so much, they're still at the back of my head! Let me go through what the statiion said, and give my own hyperbolic comments! “Yankees baseball on the radio provides a soundtrack for the summer, and it would be unimaginable to listen to the Bronx Bombers without these two iconic broadcasters,” said CBS Radio New York senior VP and market manager Marc Rayfield. Unimaginable? Really? I can imagine it. I can imagine listening to broadcasters that -- shocker -- help me understand what's going on in the game, instead of devolving into schtick and cliches and incorrect calls. Because while the Yankees' TV broadcasters are no great shakes (and I've never been a fan of Paul O'Neill the broadcaster, as opposed to Paul O'Neill the player, even before he endorsed Donald Trump) at least I can, you know, follow the game from the visuals. When it's a radio broadcast, I'm at the mercy of John and Suzyn. And that's not a fun place to be! Heaven forbid we have professional broadcasters like the Mets' Howie Rose and Josh Lewin (no relation to Squawker Jon!) who actually paint the picture of what's happening in the game. Not to mention the way every facet of the broadcast has a sponsor. I'm still waiting for "John takes a bathroom break, sponsored by Charmin" or "Suzyn's lipstick is brought to you by Revlon." Is there anyone who considers themselves the luckiest man on the face of the Earth for getting to listen to 5,000 broadcasts with John Sterling? Just wondering. Good lord. What a ridiculous comparison. Sterling and Waldman are more like the Cotton-Eyed Joe or YMCA of Yankee tradition: things that were entertaining once, but are well past their prime. Yet they keep on going and going and going, like the Energizer Bunny. You know, I wonder if WFAN, which paid a gazillion dollars to get the rights to the Yankees' broadcast, and dumped the Mets, ever wonder if they made the right decision when it comes to teams. They sure didn't make the right decision when it comes to broadcasters. Is sterling the guy that when a HR is hit says " it is high, it is far..."? ?